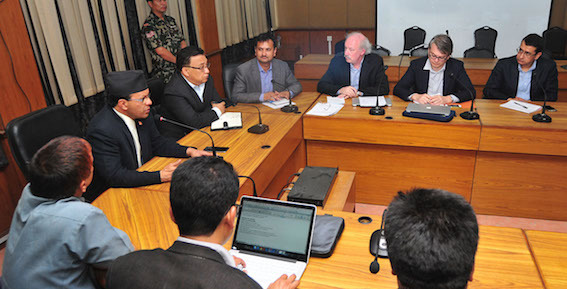 Today, the Report of the International Mission to Nepal for Promoting Freedom of Expression and Safety of Journalists was launched, outlining the findings of the Nepal International Media Partnership (NIMP), which visited Nepal from 19 to 23 April 2015. The primary goals of the Mission were to assess the media freedom situation in the country and to provide support to the then ongoing UNPFN/UNESCO project, Increasing the Safety of Journalists. The NIMP, formerly the International Media Mission to Nepal, is an alliance of 14 international organisations including UN agencies, freedom of expression groups and media development organisations, which was originally founded in 2005 to respond to the controls on the media and freedom of expression put in place in Nepal when the king suspended democracy and began ruling directly. Over time, the missions have become more focused on providing support for the ongoing democratisation process in the country. The Mission and Report focused on supporting the development of the planned safety mechanism, to be housed at the National Human Rights Commission, as well as a number of issues relating to the constitutional, policy and legal framework for freedom of expression and of the media.